In the fall of 2013 we invited you to be a winemaker with Virtual Vintner, our first community-created wine experience. After months of aging, this limited-edition Pinot Noir is ready to release! The entire La Crema team watched enthusiastically as our Virtual Vintners made the critical decisions – popular vote determined the path, and ultimately the finished wine. We can’t wait to have you taste the final product. Starting in August, 2014, we asked the community to help us craft our next wine. You had the choice between our two favorite varietals – Chardonnay and Pinot Noir. The winner? Pinot Noir! Next, we asked which AVA you wanted the Pinot to be sourced from – Arroyo Seco in Monterey County or the Russian River in Sonoma County. Russian River’s appealing fog blankets and daily temperature swings took the win. With an abundance of vineyards in Russian River, we had you pick between two notable sites – Laughlin or Piner. Our Laughlin vineyard, conveniently located right outside Winemaker Elizabeth Grant-Douglas’ office, was the winning contender. Once the grapes were harvested, we pressed the juice and sent it into tanks to ferment and extract flavor and structure from the skins and seeds. We asked you what type of fermentation we should employ – cultured, where we have more control, or wild, which is unpredictable, but with the right conditions, can contribute to complexity and roundness in the resulting wine. Being the adventurous Virtual Vintners you are, wild fermentation was the winner. After fermentation, it was time to focus on the oak impact of our barrel regime– high impact or subtle impression. You voted, and a subtle impression was the winning barrel. The final winemaking decision made was how long the wine would age in barrel. Our Vintners chose to age the wine in oak for nine months. We also asked you to help pick a name and label design – the winning combo was a collaborative effort giving the wine its own look – unique from our traditional labels – and the great name, Virtuoso, which recognizes the artistry of the winemaker and the people who appreciate fine Pinot Noir. 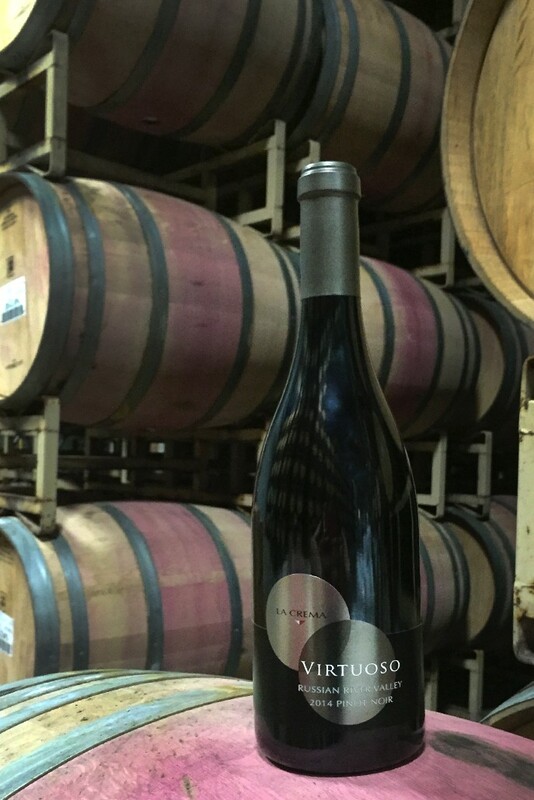 Our 2014 La Crema Virtuoso Russian River Valley Pinot Noir was released in 2015. It had notes of tart raspberry, black tea and a hint of mocha on the nose, along with flavors of berry, black licorice, red plum and cola, plus finely-knit tannins to complement a lingering finish that hinted smoke and sweet spice. While this vintage is sold out, for a similar wine, try our Russian River Valley Pinot Noir. Crowd-Pleasing. Adventurous. Sophisticated. The first-ever community created Pinot - a limited production Russian River Valley Pinot Noir.